Take the A907 road between Alloa and Kincardine, and up the B910 into Clackmannan. 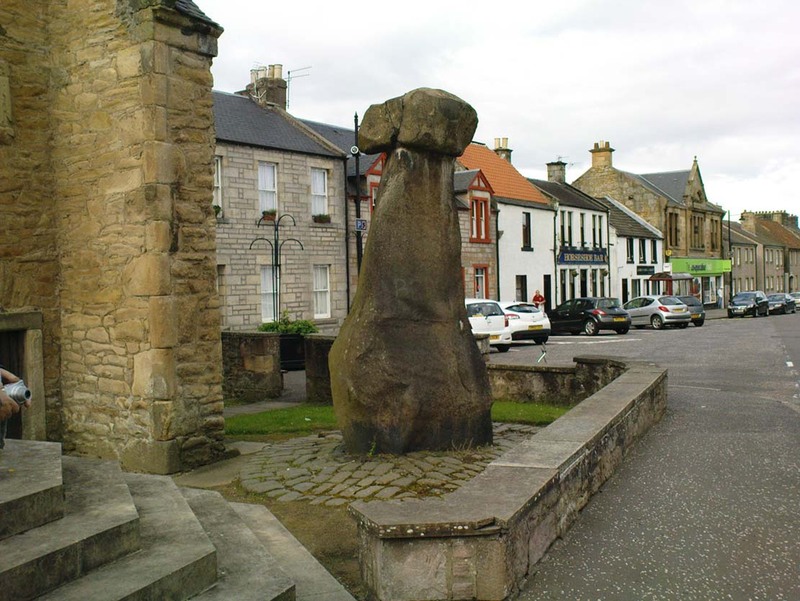 To get into the village, depending on which route you’re coming in, go up the Kirk Wynd or the Cattle Market—both of which lead you to the Main Street where, beneath the old clock tower, you’ll see the Market Cross and its companion erection just to the side. You can’t miss it! 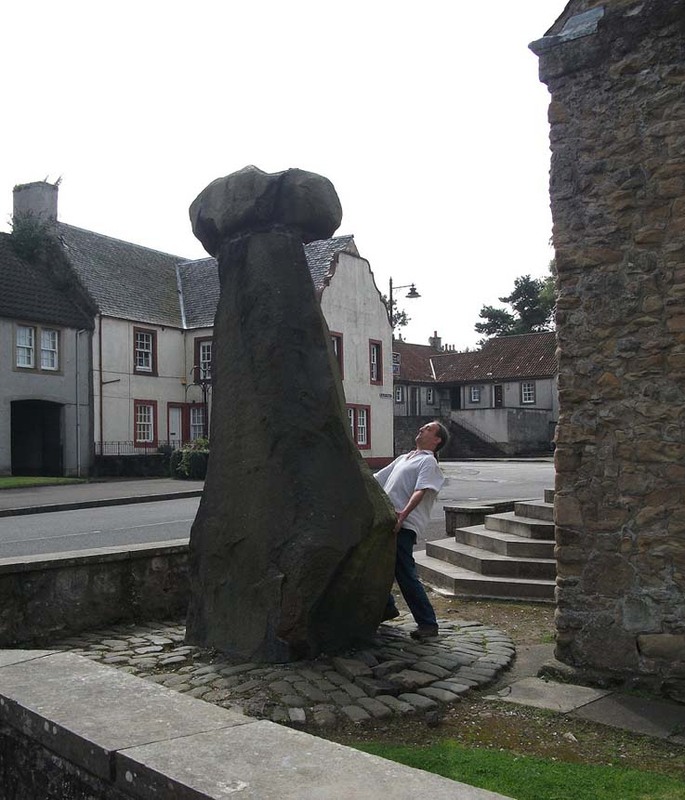 The history of this curious-looking giant phallic stone, sat quietly on the Main Street of sleepy Clackmannan village, isn’t as heathen as you’d expect when first seeing the huge upright—but there are mysteries and myths gathered about it. The county of Clackmannan itself takes its name from this stone—but not the entire stone that we see today; merely the rounded, smaller element on top. For it’s this that’s the real Mannan Stone. The rest of it, the tall upright pillar, was only attached to the smaller rounded stone—the Stone of Mannan— in the first-half of the 19th century. When T.C. Crouther (1936) wrote about this, he said how the Stone of Mannan had originally come from a position only a few hundred yards south of its present spot, at a place known as Lookabootye Brae (NS 912 911), just above where the land begins to drop down closer to sea level. This doesn’t seems too improbable. Close to this spot could once be seen the sacred site of the Lady Well. At the turn of the 21st century the stone was caged by the local council as it was beginning to crumble and was in danger of collapse; and so, the local council repaired the great upright and its sacred top-stone—albeit at the staggering cost of £160,000!!! As the local people and other masons know to this day, the job could have been done for a fraction of that cost with equal efficiency. “Its legendary history is curious. When King Robert Bruce was residing in Clackmannan tower, and before there was a town attached to that regal mansion, he happened, in passing one day near this way on a journey, to stop awhile at the stone and, on going away, left his glove upon it. Not discovering his loss till he had proceeded about half-a-mile towards the south, he desired his servant to go back to the clack (for King Robert seems to have usually spoken his native Carrick Gaelic), and bring his mannan, or glove. The servant said, ‘If ye’ll just look about ye here, I’ll be back wi’t directly,’ and accordingly soon returned with the missing article. But as the various dates in this tale simply don’t add up, it seems that the writer had been easily fooled. Adams, Edwin, Geography Classified, Chapman Hall: London 1863. Drummond, James, Scottish Market-Crosses, Neill & Co.: Edinburgh 1861. Drummond, James,”Notice of Some Stone Crosses, with Especial Reference to the Market Crosses of Scotland,” in Proceedings Society of Antiquaries, Scotland, volume 4, 1862. Gordon, T Crouther, The History of Clackmannan, Civic Press: Glasgow 1936. 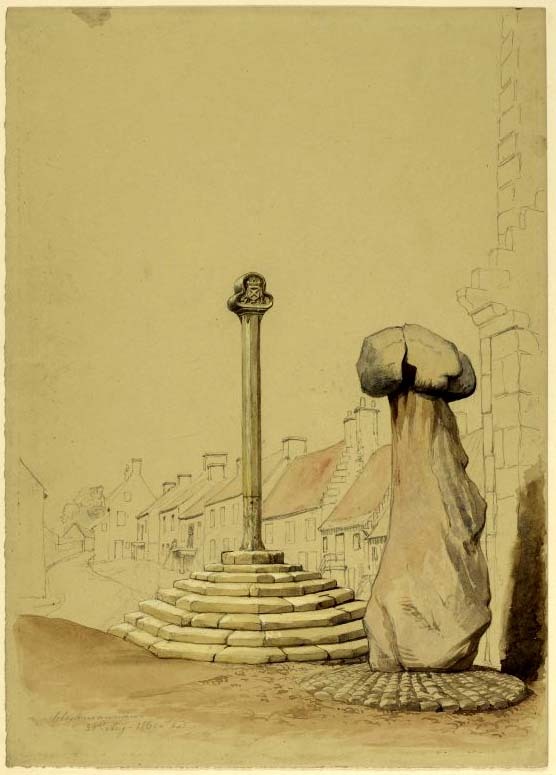 Miller, Peter, “Notices of the Standing Stones of Alloa and Clackmannan,” in Proceedings of the Society of Antiquaries, Scotland, volume 23, 1889. Rhys, John, Lectures on the Origin and Growth of Religion as Illustrated by Celtic Heathendom, Williams & Norgate London 1888. Royal Commission on the Ancient & Historical Monuments, Scotland, The Archaeological Sites and Monuments of Clackmannan District and Falkirk District, Society of Antiquaries of Scotland 1978. Simpkins, John Ewart, County Folklore – volume VII: Examples of Printed Folk-Lore Concerning Fife, with some Notes on Clackmannan and Kinross-Shires, Folk-Lore Society: London 1914. This entry was posted in Clackmannanshire, Sacred Nature, Scotland, Standing Stones and tagged Alloa, Clackmannan, Clackmannanshire, creation myths, folklore, gods, heritage, Ireland, legends, Mannan, medieval history, megalithic, Megaliths, monoliths, myths, phallic symbols, sacred sites, Scotland, Standing Stones. Bookmark the permalink. ‘Erection’ is the word there I think!